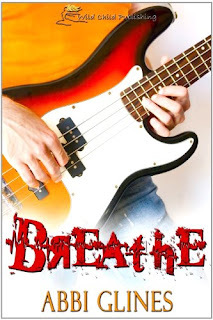 I just finished reading Breathe by Abbi Glines a few minutes ago. And OMG! Can I just say OH. MY. GOD. I sooooo love this book? The story revolves around a rock star, Jax Stone and his helper, Sadie White. I totally love this book. In fact, I love this book so much I ended up reading it in one sitting. Yeah, I know it’s kinda cliche, girl meets famous rock star, falls head over heels blah blah but this one actually worked for me. I love all of the characters from this book. First of all, I love Sadie White. She’s not annoying and she doesn’t whine like a lot of female characters from contemporary YA novels. I just love her. I like her independence a lot. The fact that she was able to “raise” her mom and all that. She had to grow up fast because of her irresponsible parent. I just love her. I didn’t like her mom though. I think she was too selfish for her own good and she does not deserve her daughter. Anyway, I’m just happy that Sadie turned out to be a very well written character. I actually liked the dynamics between the characters. Then there’s Jax. Wait, just let me get this out: JAX IS FREAKIN’ HOT! I totally fell in love with this guy. I get why Sadie was smitten. Not because of the fact that he’s so good looking and famous, this guy actually has a big heart and I love that about him. I also liked the way that he actually made a lot of effort in order to win Sadie’s heart. Bottom line is: Sadie was not the only one smitten, I WAS ALSO SMITTEN! I actually liked all of the characters in the novel. Marcus, I wanted to give this guy a hug. Amanda, Mrs. Mary, Mr. Greg, Jason, Preston, everyone. I just love this book so much and I think all of them were written well. Anyway, I love this novel a lot even though I’m not a big fan of contemporary YA’s. I wasn’t really expecting that much since I was not even able to finish The Vincent Boys by the same author. I honestly didn’t get that novel. I love this one though. I like the way it was written. TBH, I enjoyed the cheesy moments in the novel. I was actually feeling all mushy and giddy while I read. There were times when I just found myself smiling while I read. It’s a quick and enjoyable read and I wouldn’t mind reading it again.I’d recommend this to anyone who likes reading cheesy stories just to feel good or giddy.